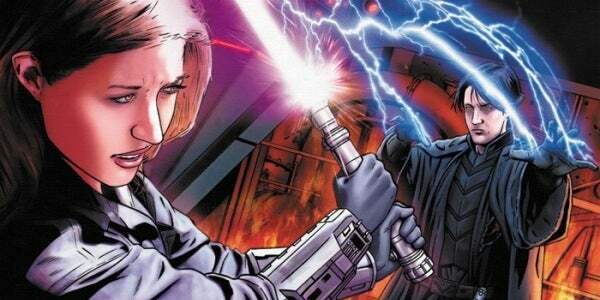 How Star Wars: The Force Awakens Canon Differs from Expanded Universe "Legends"
Major spoilers for the film Star Wars: The Force Awakens and for several of the old "Expanded Universe" now "Legends" Star Wars books follow. Do Not Read Further if you don't want to be SPOILED! The Expanded Universe. It's not just a thing that made a bunch of moronic trolls go on a spoiling spree across the internet, posting spoilers anywhere anyone was talking about Star Wars. No, once upon a time it was (and still is) beloved by many, most of whom aren't petulant children! While it's now considered "Legends," the Star Wars Expanded Universe was once the only way we got any stories that were set after Return of the Jedi. Okay, Spoilers after the jump, for real. This is your last chance. Now that Lucasfilm has a new owner in Disney, they are carving their own path in the Force. The Expanded Universe was put to the side, and a new, comprehensive, coherent canon was established. From now on, the movies, novels, comic books, and TV shows all share one story no matter what, and that means there were also major changes. Today, the story is about Rey, Kylo Ren, Finn, and Poe Dameron. But not so long ago, the story was about Jaina and Jacen Solo (not to mention Anakin Solo and Ben Skywalker). In Star Wars: The Force Awakens, there is a new generation of Force users, both light and dark. On the dark side stands Kylo Ren, whose real name was revealed as Ben Solo. The son of Han and Leia, it seems Ben was an only child. Following in his mother's footsteps, he was strong in the Force, and one of Luke Skywalker's earliest students, training to be a Jedi. Seduced by the dark side by Supreme Leader Snoke, Ben became Kylo, and took out his anger on Luke's other students, alongside the mysterious Knights of Ren. Even now, the young dark Jedi doesn't seem to be Sith per se, as he still has tendencies to the light side, and many hope he can yet be saved. Meanwile, Rey represents the light side of the Force. It's not stated, but heavily implied that she, too is a Skywalker - but the daughter of Luke and thus Kylo Ren's cousin. Rey seems to have had some training at a very young age, which was then blocked from her memory. Ironically, it's Kylo Ren trying to extract information from her that activates those latent abilities and training, ultimately leading to his defeat at her hand. The two, then, if we're right about Rey, are cousins. They represent the next generation of our three heroes from the original trilogy together, and their conflict is still akin to a sibling rivalry, despite being "merely" first cousins. In the Expanded Universe, the first version of post-Return of the Jedi stories, things weren't all that different. There, in very similar roles, were the twins Jaina and Jacen. Both were the children of Han and Leia, like Kylo Ren. The similarities don't end there, though. Jacen and Jaina were both students of Luke Skywalker, and powerful, accomplished Jedi Knights. Jacen, however, was lured to the Dark Side. His fall came out of a desire to bring order to the galaxy in order to protect it, much like Darth Vader before him (another thing Kylo Ren, who wants only to "finish what you started, Grandfather" seems to have in common with Jacen). As Darth Caedus, he killed his aunt, tortured his cousin, and generally bought pain and ruin to the galaxy. Eventually, it was up to his twin sister, Jaina, to defeat him - and she did, killing him in the process. If Rey is in fact Luke's daughter, then she's also not his first child thanks to the Legends world. In that now-defunct world, he had a son, though, not a daughter. Ben Skywalker was named for Obi-Wan "Ben" Kenobi. He wasn't exactly a natural with the Force, and his cousin, Jacen, became his informal master, helping him learn the ways of the Jedi. That is, until he turned on his apprentice and cousin. So, while the Expanded Universe stories are now merely Legends and "don't count" in the modern-day canon, it's clear their influence was felt when developing the new stories. While some see this as a horrible affront, many choose to see it differently, embracing now having two different Star Wars worlds to learn, know, and love.